1) You will probably want to have your station manned during this event to make sure that all goes well. This fall we will have a full national test (using the same Event and Location Codes). We will be reporting back to the FCC after the test using then new Electronic Test Reporting System. If you are not familiar with this – The time has come for you to get up to speed. 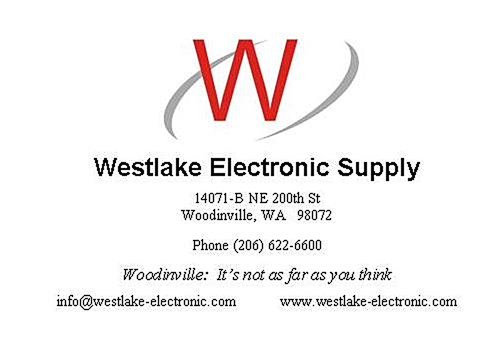 Speaking of being subscribed to the EAS Remailer – That system recently distributed a number of Washington State EAS Plan updates so that all participants can keep their copy of the State Plan current. Keep in mind that the FCC wants you to have a current EAS Plan. A CSRIC Working Group has been toiling to create a new EAS Handbook. When this becomes available, you will find it to be much improved over the document that you have to have in your control position presently. The FCC, earlier this year, released a Notice of Proposed Rule Making (NPRM) that, if fully enacted, will make some sizable changes to several facets of EAS. The Washington State SECC (EAS Steering Committee) formed a committee to draft a response. That response was approved by the SECC at its May 11th Meeting and was filed with the Commission on May 19th. Thanks to a number of local broadcast engineers for assisting with this project. You can read it, along with other comments at the FCC’s location for filed comments. There is always a need for volunteers to help lead our State EAS Activities, especially at the local level. A key component of our EAS operation is the LECC or Local Emergency Communications Committee. There are one of these in each Operational Area in the State. If you are interested, drop me a note and I can provide all the details. On that topic – Kudo’s to John Price who recently stepped up to lead the LECC in the Mason/Thurston county Op/Area. John recently retired from Entercom. Interestingly it was John and the late Jimmy Hocutt that twisted my arm almost 20 years ago to get involved with the, then new, EAS. If you are here in the PNW (Pacific Northwest) you certainly enjoyed our summer preview in the form of wonderful warm, record setting, weather. Then, about the middle of May, Mother Nature reminded us of where we live and returned us to cool, moist conditions. But not before we had a couple early season forest fires not all that far from Seattle. Now if I can just talk Mother Nature into giving us a bit more of that wonderful stuff during the first weekend in June when I will be in Seaside attending the annual Amateur Radio doings on the Oregon Coast. I’ve enjoyed a couple of opportunities to take some, out of town, engineers up to West Tiger. Always interesting to see/hear their expressions. One fellow, from Atlanta, could not help but marvel at the view from the top. I told him to think of West Tiger as a 3000 foot tower with the first 2800 feet being dirt. He explained that Atlanta’s sites are pretty much all tall towers. Another fellow, from Boston, kept remarking on how green it was. I reminded him that it was green there too…to which he replied, yes, but not this green. He was fortunate to have been able to take a route trip ferry ride to and from Bainbridge Island on an 80 degree day….Likely he will never be the same. Never thought that this would happen – But the end of May starts the long awaited process whereby the Commission hopes to come up with 126 MHz of spectrum in the first round of bidding in its reverse auction. The revolution has begun. To be sure, this is a complicated process that will be followed closely by all those that cover the electronic media. I guess the part I am most interested in is just what will the TV Channel line-up look like when the dust has settled. Back on May 11th a good sized chunk of Seattle found itself without power in the early morning hours. Apparently cameras recorded the critter causing the flow of City Lights electrons to stop was a raccoon who, for some reason, was able to scamper away. You would think, in this day and age, that sub-stations would be more secure….apparently not. Then on the 25th of May downtown Seattle had its lights go out due to an unknown cause at a sub-station. What made this interesting is that CNN picked up the story and let the world know about. Seattle City Light is likely wondering what’s next as these types of events often come in 3’s. A recent study has revealed that 3 in 10 U.S. workers foresee working past conventional retirement age. 31% of non-retired workers said they will retire – after age 67. Only 23% plan on early retirement, or before age 62. How many of you are old enough to remember when CBS used their full-name? Speaking of CBS – The talk that CBS will spin off its radio operation gained a bit of news recently when the CBS chairman and CEO , Leslie Moonves, recently spoke about plans for what he calls the ‘radio unit’. He said there were interested investors and strategic partners and a spin-off is likely in Q-1 of 2017. 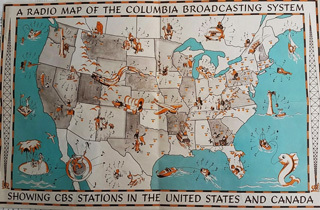 CBS Radio operates many stations where this column is read – including 3FM’s and an AM in Seattle where they also own KSTW-TV. So how big is CBS Radio? Reports are that it generates 1.2 Billion dollars in revenue. Sort of gives you an insight into things when they want to spin off this little radio division….apparently 1.2B does not mean all that much in the scheme of things? And, on the subject of CBS, the battle continues over the ailing Sumner Redstone and who will end up controlling Viacom and CBS. This one has all the ingredients for a soap opera! Anyone notice something unusual about the following ? 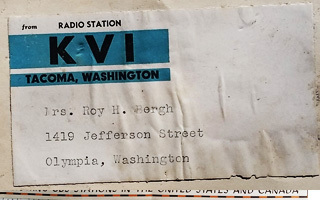 Yup…This was from back when KVI was a Tacoma Station, prior to their moving to Seattle. Perhaps this was the first broadcast station to ‘jump-ship’ from the City of Destiny? Congrats to Doug Irwin on his promotion to DOE of iHeart’s Los Angeles cluster. Doug was the Chief of their Seattle operation a few years back. Speaking of radio station memory makers – I found this item, on the wall, at a local (Auburn) Les Schwab Tire store. This was an artist drawing of Auburn…In the lower right side was something that attracted my attention. 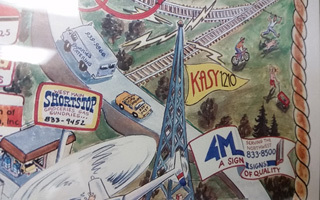 A radio tower and the call letters KASY. Again my smartphone/camera captured the image to share with you. A lot of history with this station. 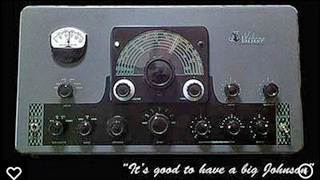 It was put on the air back in the 50’s by Ed Garre operating with 250 watts, daytime only, on 1220. Later when the clear channels were opened up, they moved to 1210. The call letters KASY were chosen as Auburn was known as a railroad town after the American Folk Hero – Casey Jones. The KPLU drama continues with the Seattle Times printing a front page story on the 15th about some of the background of the KPLU/KUOW deal. At this writing KPLU appears to be getting ever closer to their goal of raising enough money to perhaps purchase the Station from Pacific Lutheran University. Perhaps revelations of how this deal came down will serve to help the station with that effort? The matter of how to help AM Radio is still very much in the news with comments being filed in response to the FCC’s NPRM dealing with the issue. One area that I found interesting is the apparent ‘disconnect’ within the FCC involving the role of those AM’s that are involved as Primary Entry Point (PEP) stations and the Emergency Alert System. Unfortunately the Commission never did fully consider the fact that these stations, like KIRO-AM-710, reduce power and/or use directional antennas at night in their planning for the PEP system. The thought that the nighttime protection of these stations would be reduced in the name of improving AM appears to me to be contrary to that mission. Perhaps this is another case where the Left/Right hand rule prevails. (Left hand not knowing what the Right hand is doing) ? There are 36 Stations listed in the rating results. Seattle School District KNHC at #29 out-rates #33 KCIS, #34/KHHO and #35/KFNQ. Only Clover Park’s KVTI-(FM) comes in lower at #36. I recall, writing in this column, not that many years ago, about how many of these AM’s were in the top 10. KOMO and KIRO where there for years. Which makes me wonder if these 5 AM stations were not owned by firms operating, perhaps, profitable stations in this market and were stand-alones….would they have been sold off or have had their plugs pulled ? Frankly it’s hard for me to believe that these lower ranked AM’s are going to stay economically viable in the long term. Am I missing something here? Looks to me like there are going to have to be major changes to see AM Radio regain its former glory. Perhaps we should start with the fact that many people today no-longer listen to AM for the simple reason that it’s out of style and view as a dinosaur? Are you ready to migrate your public files on-line? The FCC has set June 24th at the date when the first group of radio stations have to do so in the Top 50 markets. I remember being the designated public file person in the past with lots of paper files etc. Certainly a huge change for everyone. One loss …The fear that someone would come in and swipe something that the FCC would be in the next day and want to see. When completed, this change will involve radio, TV and Cable. Don’t put away the thought of paper files totally, however as letters and emails from the public will still have to be saved. On the subject of the FCC and changes therein – The Commish has launched something new for your browsing pleasure – An online Consumer Complaint Data Center. www.fcc.gov/consumer-help-center-data A quick look at this revealed a large number of complaints involving, as expected, robo calls etc. Lots of cool sorting functionality is included. Recently Radio World has been doing something interesting – doing stories on technical workers in the broadcast industry that are under 40 years of age. This is especially interesting in this day and age of old, wrinkled, gray or missing haired people  Attending any SBE Chapter meeting you are quickly struck with the thought that there are employment opportunities ‘. Back to the piece in Radio World – Much to my delight they featured a story about a young fellow that many of us know – Alex Brewster, grandson of local broadcast legend Jim Dalke. Alex is now working for Doug Fisher out of Olympia. One of their most recent projects was the new technical facility for Bustos Media in Kent. There has been a lot of press recently about two of the major players in the Radio industry, Cumulus and iHeart (formerly Clear Channel) both of whom are struggling with massive debt. iHeart alone is almost $21 Billion in debt….A figure that is very hard to get your head around. As happens, those who own that debt are getting restless. A couple actions are in the news – They have hired a firm to help them re-structure and now some of the decisions are being made in court. I would think a lot of apprehension is the result. Some have expressed the concern that all of this is hurting the brand especially since the ‘B-word’ is being used. The problem is that if they go that route, the creditors may receive less than if they figure out a way for the company to survive and, eventually, pay them back. The firm owns a number of radio properties in the Seattle area. Meanwhile – On the sunny side of the street – another radio broadcaster appears to be doing well….Entercom. They are basking in the recent news that Moody’s has raised their ratings on the company. Entercom, who owns clusters of Stations in Seattle, Portland, Denver and other markets appears to be doing well with revenue increasing. Speaking of Entercom – as of this writing, they have still not filled their Chief Engineers position in Seattle created by the retiring of Dwight Small. Uniquely they have been rotating personnel from other markets through Seattle while the process continues. A number of new items were shown at the recent NAB that got my attention. One was that long time manufacturer of AM Radio components, Kintronic Labs, has announced they are making devices that would be used with FM Broadcasting such as – Combiners, filters etc. Could it be that they have seen ‘the writing on the wall’ regarding the future of AM Radio and decided rather than go down with it to branch out? That is certainly a conclusion that is supported by what they were showing in Las Vegas. One thing is for sure, it likely that a whole lot less money is being spend on AM projects these days. Matt Green is to become the new Chief at Entercom’s radio cluster in Seattle. Matt has been in this business for 42 years, the past 6 with Bicoastal Media where he traveled between Hood River, Longview and Chehalis from his home in Portland. Matt would be filling the shoes of Dwight Small who exiting for retirement land and the pleasures of Lake Cavanaugh where he is building a new home. 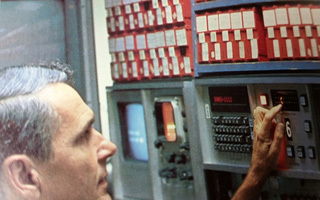 The first one will be familiar to any of you that recall the latter days of 2 inch tape in TV. Radio had long been putting ¼ inch tape in plastic boxes and using these ‘cartridges’ in automation equipment. TV was not so lucky. Spots were still be played on reel-to-reel machines that had to be manually loaded …Something that radio had managed to get away from. Then along came RCA with a solution…The TCR-100. The following was found in an old RCA Catalog. 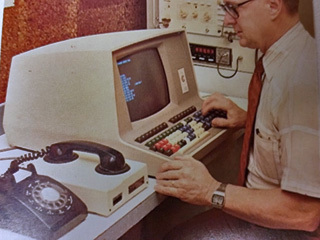 Another old catalog turned had this picture – Remember the acoustic telephone modem that ran at the blazing speed of 300 baud? We will all have to just wait and see how this impacts us all…Interesting times we are in. If you did not make it to the NAB convention- The Engineering Conference Proceedings are now available at the NAB store (NABStore.com) for $99. Comes on a USB drive. Talk about German Engineering…..the city of Augsburg became concerned as to why pedestrians were ignoring traffic signals. A big of research turned up the reason…They were busy looking down as their smartphones. The solution – embed traffic signals in the pavement so those that are constantly looking down will see them. A survey conducted by UofW here in Seattle found that one-third of people in this country are busy texting or other smartphone activity at dangerous road crossings. I can see it now…In addition to rainbow pedestrian crossings, they could be sporting red, yellow and green lights too. For those of you in the Seattle area you likely know about how Amazon has become a major player in today’s world. The growth of this firm has been nothing short of outstanding. Their new building complex in Seattle is changing the skyline of our city in a big way. One of their triad of new buildings has a most unique name – ‘Doppler’. The Seattle Times must have a writer with some understand of the term as the headline read ‘Doppler Effect’. Like many other Seattle success stories, it was not long ago that the word Amazon – ONLY – meant a river in South America. 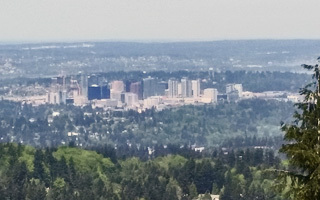 While visiting Cougar Mountain recently (on a clear day) I took this picture of Downtown Bellevue. Amazing how fast this little ‘East-side shopping center’ has grown up. If you look close, on the left, you can see more high-rise buildings under construction. The local battle over who is going to be operating KPLU appears to be about over with the news that fund raising efforts toward keeping the station from being sold to KUOW have been successful. I’m sure there are a number of things that have to be accomplished before a formal announcement is made, as is the case in these kind of things. I get the feeling, considering the relationship between the station and long-time owner Pacific Lutheran University, that would should, perhaps, expect a change of call letters. Will it become KPJZ or whatever will be determined. Pacific Lutheran has owned the station for about 50 years. 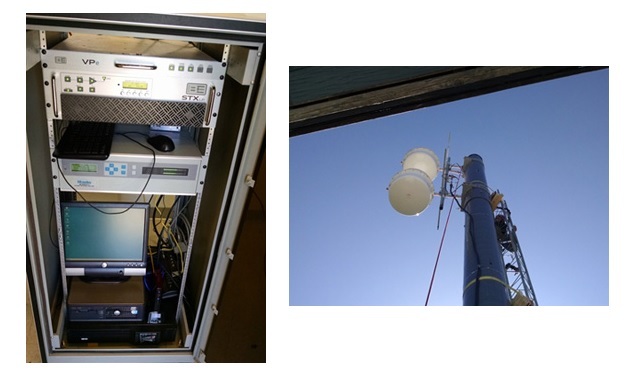 Moved to West Tiger Mt in 1988 where they operate via the Master Antenna. Later installed an Aux Transmitter at the then Entercom site on Cougar. 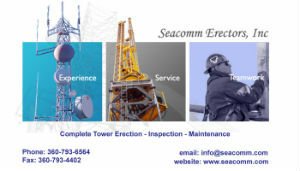 They also operate an extensive network of other transmitters and translators in Western Washington . They operate two program streams – On FM Jazz and NPR news, On HD2 Jazz 24. Studios are in a relatively new, stand alone, building on the PLU Campus that was built for this purpose. Also operate a studio/news gathering operation in downtown Seattle. 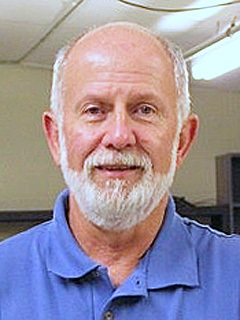 Their first Chief Engineer, David Christian, has been retired for some time. Their second Chief, Lowell Kiesow, is still employed, his assistant is Nick Winter. Every wonder what would happen should the GPS system go down? In a relatively short time a whole lot of things we now take for granted would stop operating. Zillions would be taking their gizmo back to where they got it wanting It repaired. Why did I think of such a thing…Well, once in while some vendor who relies on their GPS Nav-Aid will call me asking how to get to either Cougar or West Tiger (the places I go, at least, once a week. Recently a fellow said he was north of I-90 somewhere trying to find West Tiger. I could not help myself …so I asked if he had a map  There was this long pause and proceeded to give him directions. Like a lot of technology these days we have become so over dependent on it that if it were to go down we’d be hard pressed to function. With that being said, the whole GPS system will, one day, be the target of those who get their thrill by doing wrong. So, just in case, tell me where I can find a gas station that has maps. Not sure what Impact it will have on our industry, however a new rule by the US Department of Labor may mean a pay raise for many who work in broadcast stations. According to the DOL, 385,000 broadcasters may be in line for additional compensation. One of the major changes is the fact that the new rules will impact some that are not currently don’t get overtime for working long hours etc. As you might suspect, not all of this is going down well with some in the industry, especially those small operations that are struggling to stay afloat. Some who are presently salaried may find themselves hourly and perhaps not working over 30 hours at that. 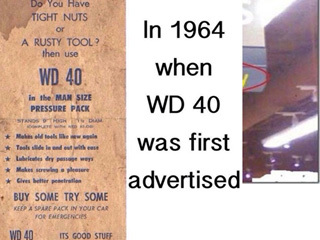 Fast food has been doing it for years . I am tardy in congratulating you on your 30th year of Clay’s Corner. Your steadfast reporting for all those years has been, and is, a great contribution to the history of our profession in the Northwest. Your column in the Waveguide is what I read first every month! Also, thank you for your kind citation in your February 2016 column of my improvised metric, “kilowatt feet”, for illustrating the advantages of high elevation transmitting sites, such as was provided by your pioneering efforts at West Tiger Mountain. Stan and I had kept in touch after he moved back to the Walla Walla area from Seattle. I last visited with Stan at College Place in January. He’ll be missed. Stan was 86. The repairman told us that one of our problems was that we did not have a ‘large’ enough motor on the opener. I thought for a minute, and said that we had the largest one the company made at that time, a 1/2 horsepower. He shook his head and said, ‘Lady, you need a 1/4 horsepower.’ I responded that 1/2 was larger than 1/4. 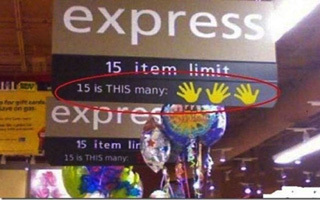 He said, ‘NO, it’s not.’ Four is larger than two. I said “May I have large bills, please”. Ever notice how call letters once associated with stations in the Seattle area seem to be picked up by others? For example….KBSG, once the call letters of 97.3 in Seattle are now in use on the Coast. KLSY, once the call letters of 92.5 in Bellevue is now in use from South Mountain on 93.7 as a Latino Christian Station. KNBQ, the call on 97.3 prior to KBSG is now heard in Central Park, near Aberdeen. 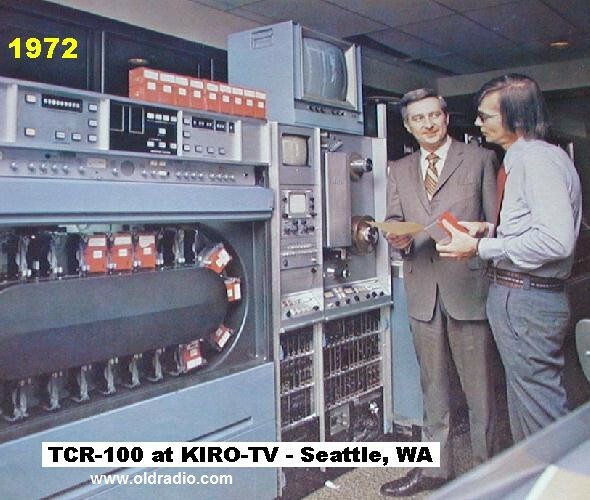 More recently the call used by the 104.5 that moved to the Seattle area from Hood River, Oregon, KMCQ will be used by a new station near Oak Harbor on Whidbey Island. That’s it for this month. Lord willing I will be (mostly) back in some of these same locations.